Due to the threat of bad weather and the re-scheduling of Downtown Trick or Treat, the Legend of the Bell Witch will be tomorrow, Tuesday, October 30 at 5:30pm at the Pennyroyal Area Museum. Contact the Museum at (270) 887-4270 for more information. Museums of Historic Hopkinsville-Christian County! 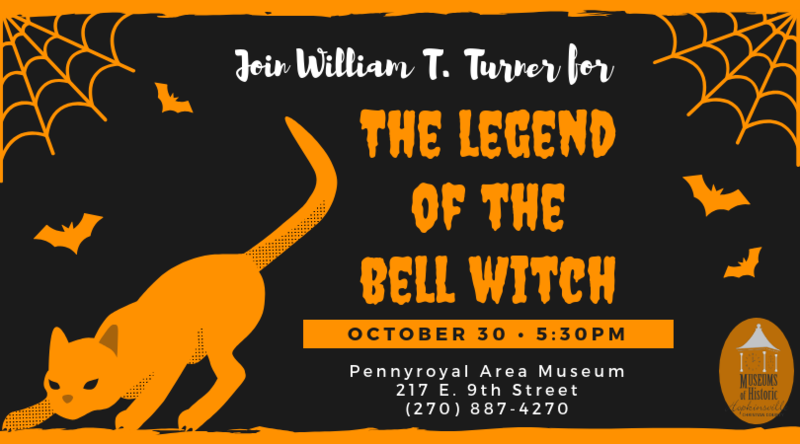 Join us Halloween night at 5:30pm, immediately following Downtown Trick-or-Treat, at the Pennyroyal Area Museum for William T. Turner’s recounting of the Legend of the Bell Witch. This haunting account of a poltergeist-like spirit who terrorized the family of John Bell in nearby Adams, TN is the most well-known ghost story in the region. Whether young or old, this tale is guaranteed to send chills up your spine! This Hopkinsville Halloween tradition is FREE to the public. This event also offers you the once-in-a-lifetime opportunity to see the old Post Office completely empty in preparation for upcoming renovation of the Pennyroyal Area Museum. The big, empty building is sure to add an extra layer of mystery and spookiness to this popular ghost story!